Bob and Laura Reynolds have a history of giving back and making a difference through their philanthropy. That was never more evident than today (Feb. 10) when West Virginia University announced that the Boston couple is giving $10 million to the WVU College of Business and Economics. The gift will provide initial funding for a building in their names at a new business school complex on Morgantown’s waterfront, as well as propel other academic components of business education at B&E. Bob, a 1974 finance graduate of the WVU College of Business and Economics and a member of the WVU Foundation board of directors, is president and CEO of three multinational companies: Putnam Investments, Great-West Financial and Great-West Lifeco U.S., Inc. The couple has been philanthropic at WVU, as well as in Boston and West Palm Beach, Florida, where they are residents. The leadership gift will be part of the highly successful “A State of Minds” comprehensive private fundraising campaign for WVU, of which Bob Reynolds serves as co-chairman. The campaign, which runs through the end of the year, has raised $1.069 billion through December 31. President Gee said the gift sets into motion two very important benchmarks for WVU and B&E. “I am a firm believer that you cannot have a great university without a great business school,” said Gee. “This generous gift by Bob and Laura will not only help construct a new building in their name, but will also help launch our plans to build a new College of Business and Economics complex..
“This complex will not only be transformational in what it provides West Virginia University from an academic perspective, but it will also recast a portion of Morgantown’s waterfront into a hub of business activity,” he added. Reynolds, a native of Clarksburg, attributed his successes to the university that molded him. The new B&E complex would be located on the site of the current Stansbury Hall. Built in 1928 as Mountaineer Field House, university officials have studied possible uses for the facility for nearly a decade. It is also the structure where iconic alumnus Jerry West played basketball for the Mountaineers in the late 1950s, and a site where West said a new business school complex would help the university and the City of Morgantown flourish. West, a 1960 WVU graduate, also knows what it feels like to be the parent of a business school student. His son, Jonnie, who also played basketball and earned a sports management degree at WVU, earned an MBA from B&E in 2011. At age 27, Jonnie is the associate general manager for the Golden State Warriors’ (Development) D-League affiliate team in Santa Cruz, California. Reyes said a newly constructed business school will open even more doors of opportunity for students, and provide more space and resources for faculty. “We believe that the true differentiator for B&E will be that of experiential learning and the overall role it plays in the student experience,” Reyes said. “Our model of education reflects a blend of classroom learning with experiences outside the classroom, ranging from learning labs to events, and from group participation-based projects to training designed to ready students for their careers. WVU Foundation President and CEO Cindi Roth said the project is exciting because the new business school complex will provide facilities and opportunities that will have a wide-ranging impact. The Reynolds have made major gifts to a wide variety of causes and programs across WVU over the years. Their support includes the creation of scholarships, an academic performance center for student athletes at the Puskar Center, funding for the indoor basketball practice facility, renovations to Milan Puskar stadium and funding for a student managed investment fund at B&E. They were honored by the WVU Foundation in 2013 with its Outstanding Philanthropists Award and are members of the Woodburn Circle Society, the Foundation’s most prestigious philanthropic society. Bob Reynolds is a member of the WVU Academy of Distinguished Alumni, a 2016 inductee in the WVU College of Business and Economics Roll of Distinguished Alumni and a 2010 inductee in the WVU College of Business and Economics West Virginia Business Hall of Fame. For more information on the WVU College of Business and Economics, follow B&E on Twitter at @wvucobe or visit business.wvu.edu. 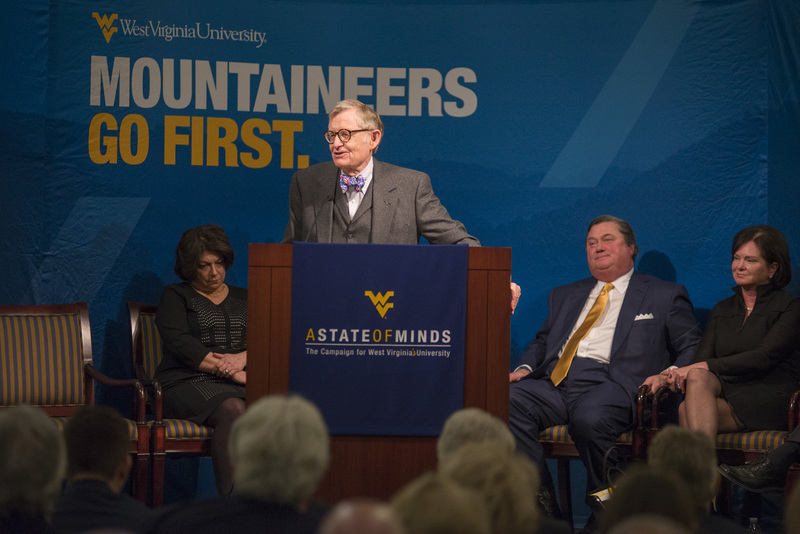 WVU President Gordon Gee speaks at the announcement of Bob and Laura Reynolds' gift to the College of Business and Economics. © 2019 West Virginia University. WVU is an EEO/Affirmative Action employer — Minority/Female/Disability/Veteran. Last updated on March 6, 2017.